The American Human: While You Weren't Looking: The Republican Party Was Hijacked by White Nationalists. While You Weren't Looking: The Republican Party Was Hijacked by White Nationalists. 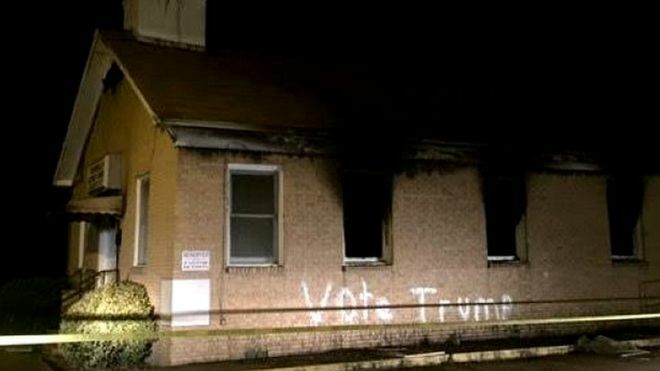 A Mississippi black church firebombed with "Vote Trump" spray-painted. A black church burned in Mississippi would seem an isolated incident in this political season if it weren't incontrovertibly tied to a white nationalist surge across the country. It shouldn't be, but it's still striking to me that even so-called "reasonable" conservatives won't condemn GOP for attacks on black voting. Efforts to purge voter rolls in North Carolina counties runs counter to federal law but is proceeding anyway, targeting mainly minority voters. Texas passed voter-ID laws that courts later overturned but have been slow to correct what appears to be a coordinated misinformation campaign, leading to mass confusion among minority voters. Wisconsin passed -- then the courts overturned -- voter-ID laws but have slow-rolled the corrective actions to be undertaken at state DMV offices. A GOP congressman admits why. In Florida, Governor Rick Scott refused to extend voter registration despite massive disruption from Hurricane Matthew, but a judge stops him. Governor Scott also got nailed for illegally purging the voter rolls, targeting mostly minorities. Some 201,000 may have been affected. Voter suppression efforts have been chronicled across the nation, either in red states or by GOP-dominated legislatures. Sensing a pattern here? Oddly the Trump campaign has been boasting of "voter suppression" as a campaign tool, and white nationalists are gearing up for voter intimidation and poll-watching tactics to suppress minority voting in order to help Donald Trump. This is not happening in a vacuum. Sure, Republican efforts have ramped up in recent years as minority voters become major demographic threats to GOP chances. But the all-out nature of the struggle to "make America white again" has been a major undercurrent of the Trump ascendancy. When this election cycle is over and the Republican Party undergoes a reckoning -- similar to what they underwent after 2012 -- it will have to wonder what's left of the party and wither it will go in the future, if it even has a future.